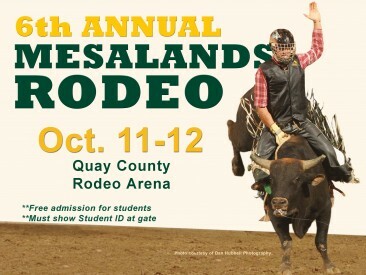 Mesalands Community College will be hosting its 6th Annual Rodeo for the Grand Canyon Region, October 11-12, 2013, at the Quay County Fairgrounds. Join us for Stampede Week, October 7-12, 2013. The Rodeo Performance is Friday, October 11th at 6:00 pm. On Saturday, October 12th, slack begins at 9:00 am and the Championship Performance is at 6:00 pm. Tickets are five dollars for adults, two dollars for children and seniors 55 and over. To become a sponsor for the nationally ranked Mesalands Rodeo Team please contact (575) 461-4413, ext. 138.